"I wanted to change the world, but I'll settle for ending yours"
No don't run and get your grandfather. Sherlock Holmes may have been lost to the pages of literary history for longer than any decent concept should be allowed to suffer, but with this film director Guy Ritchie cleans off the cobwebs, using more than enough 'brainpower' to make other big screen franchise adaptations commit murder one. 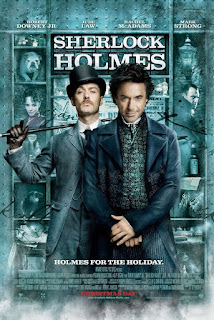 Serial killer Lord Blackwood swings from the hangman's noose thanks to England's finest detectives; Sherlock Holmes (Robert Downey Junior) and Dr. Watson (Jude Law). Now as they set to end their age-old partnership, news rocks London the sorcerer has risen from the grave. Beating the gadget reliant likes of James Bond, Batman, and yes even CSI, the duo employ only brains, early science, and action to quell a city in chaos over the rise of black magic, and the body count involved. Watching Downey Jnr and Law interact is a true Hollywood 'Eureka!' moment, and it takes all the skill of Rachael McAdams to ensure her role as Irene Adler (the only criminal ever to outwit Downey's new, tougher Mr Holmes) isn't eclipsed by the one-liners and mannerisms of the 'bro-mance'. With her true allegiance dubious, a fourth party in the shadows, and an abundance of plot twists, there are plenty of mysteries to be had by audience bound super-sleuths, in a movie fitting the worlds foremost detective mind. Flawless production values, and a proactive way of using a 'flashback' that stands to be as imitated as 'Matrix slow motion' means this block-busting thriller doesn't just make a modern Sherlock Holmes out of a Victorian detective, it makes him a victorious one.